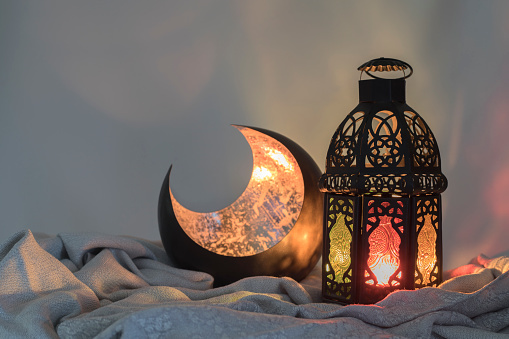 Ramadan is the ninth month of the Muslim calendar, calculated according to when the crescent moon is sighted. During this entire month, adult Muslims do not eat from sunup to sundown. This is called fasting. In the evening, the day's fast is broken with a meal called iftar. Before the day's fast begins, Muslims eat a pre-dawn meal called suhoor. When the month is over, Muslims celebrate a three-day holiday with feasting and gift exchanges, called Id-ul-Fitr (the Festival of Breaking the Fast). Ramadan is very important to the Muslim faith. It is the fourth "pillar" of the five pillars of Muslim religious obligation. In addition to fasting, Muslims pray more often, read the Qur'an (holy text), and give to charity. Because this is a unique time, many Muslims prepare special food. According to TheHolidaySpot.com, at sundown each day fasting is broken with sweet dates and water or an apricot drink. Following this is a traditional soup, such as lentil, and a bread and greens salad like fattoush. There are no restrictions with the main meal: "Olives, cheeses, meats, everything goes." Learn about "the month of fasting." Includes a glossary of some Islamic terms. Six themed sheets ready to print out and color from Crayola.